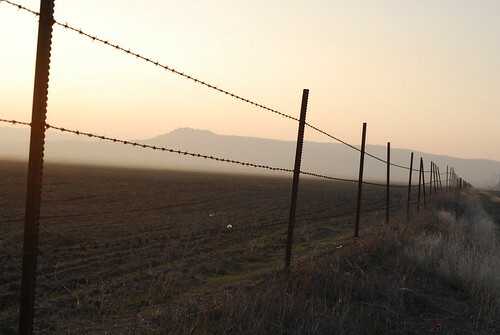 A rusty fence runs off into the sunset, alongside a road somewhere in the hills between California's Central Valley and the coast. That's a great photo. I've always been fascinated by 'perspective' photos showing things - powerlines, roads, rail tracks - receding into the distance. Yes, and this one's a little different. Possibly because it's so close that you can see the barbs on the wire and the blades of grass on the ground. Looks like it could be a shot from No Country for Old Men! Very evocative - could have come straight from The Octopus.